Here are a few effective ways to keep your landscaping bee-friendly. 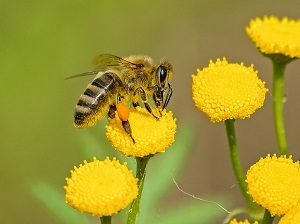 Most people want to do everything that they can to keep the bees away, but others wish to create a space that is more welcoming to the bee community. There are 4,000 species of bees in the United States alone. There’s an even bigger community of people who find them to be intriguing and fascinating flying insects. Here are a few effective ways to keep your landscaping bee-friendly. Maintain a significant number of trees and shrubs on your property. Woody plants are great for attracting bees because they provide a valuable and sufficient source of nectar and pollen. In the early spring, bees depend on maple, poplar, oak, and willow trees. Deeper into the season they gravitate toward redbuds, cherries, and crabapple trees. In the heat of summer, locust trees, basswoods, and sumacs become the main source of nectar and pollen for bees. A great variety of these trees will keep the bees buzzing throughout the spring and summer. Flowers that have been bred to wield extra flower petals for visual appeal aren’t so appealing to bees. Flowers like perennials and flowering woody plants have little to no nectar or pollen. Those flowers essentially become useless to bees, making them move to other landscapes. Stick to single-flowered plants to feed hungry bees. A variety of plant species that will bloom in succession will keep the bees coming to your property. Bees are active from early spring and through the fall. To remain bee-friendly through their active seasons, focus on maintaining forage plants from March through October. Add witch-hazel of crocus plants for the early seasons and a variety of plants with blooms carefully scheduled through the rest of the year. At Honeysuckle Nursery and Design, you will get construction and maintenance crews on site who have ten years or more of experience in all types of landscaping. Our designers will work closely with you to understand how you want to use your space so that we can make the most of your entire site. We are committed to providing complete customer satisfaction and will work with you along every step of the way to be sure that you are happy with your landscape design. Ready to start planning your new professional landscape design? Call us at 410-849-5119 or send us an email to schedule your free no-obligation estimate today! Follow us on Facebook, Twitter, Google+, Houzz, and Youtube! This entry was posted on Friday, June 1st, 2018 at 4:56 pm. Both comments and pings are currently closed.